The holidays are quickly approaching, and it is important to be prepared. Along with shopping for friends and family, many business professionals are also in need of the perfect corporate gifts to give their boss, coworkers and clients. It can be difficult to find a high quality gift in the retail industry that is both meaningful and work appropriate. However, we have found some of the best tips for choosing corporate gifts that are sure to bring smiles to your office this holiday season. The first and most important tip to picking the perfect holiday gift is to identify your relationship with the recipient. 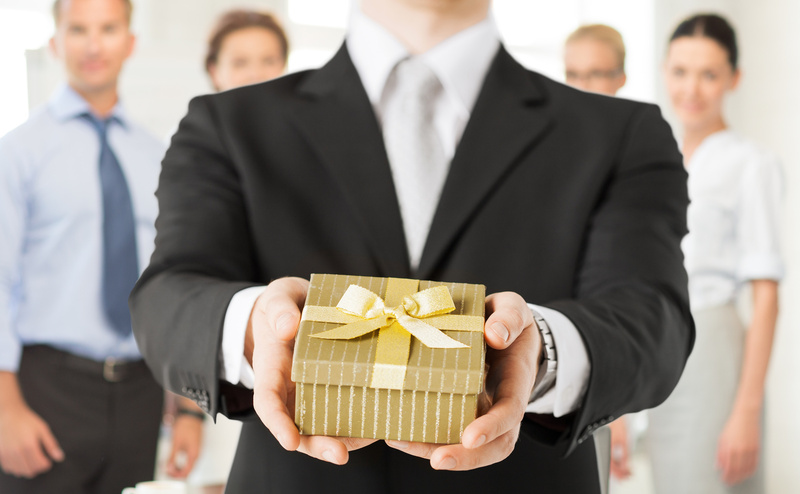 If you are giving a gift to your boss consider: are you friendly or do you rarely talk? Likewise with a client: do you have a humorous relationship or do you both err on the conservative side? These are important questions that will help you to determine the best type of gift. For more distant relationships, stick with conventional and professional gifts like perhaps, a gift card to the nearest Starbucks franchise. Whether you are shopping for your boss, a coworker or a client, it is important to consider their values. For example, if your client is a health nut it may not be the best idea to get them a box of Godiva chocolates. The first gift to come to your mind may not always be the right one. You should always consider the person you are shopping for rather than just buying any generic present. Corporate gifts should always maintain a level of professionalism, but you cannot ignore the recipient’s personality. When in doubt – everyone loves food. Food baskets make great corporate gifts, albeit a little bit played out. However, even if your gift is not the most original, the recipient is sure to find someone to enjoy it. This is a great benefit to purchasing gift food baskets as corporate gifts. You may even want to consider corporate logo cookies or other branded food items. This adds a unique touch to your gift baskets. You may even be able to find a wine franchise that personalizes bottles. This is another excellent option. If you do not know what to get for your employees or supervisors, consider corporate branded cookie baskets or other types of food items. When in doubt, the best gift that you can give is something useful. Office supplies, coffee mugs or a gift basket are the easiest way to please a tough person to shop for. You may want to buy them an accessory to compliment their professional dress attire. Best of all, they will think of you every time they use the gift. Useful items are the best corporate gifts you can give because they are timeless and easy to personalize. Speaking of personalization, that is your next tip. No matter what you purchase, corporate gifts can always be given a little extra something just by being personalized. A monogrammed or engraved item will show that you put a genuine effort into the present. This is the perfect way to make your gift stand out and feel special. Quality should be an obvious factor when buying corporate gifts. You do not have to pay luxury prices, but this is not the time to be cheap either. If you have limited funds, make sure the gift is very personal to make up for its quality. The gift you give reflects your values as a professional, so make sure that the gift is up to your personal standards. Packaging is just as important as the gift itself. Be sure that it is wrapped or bagged nicely so that your boss, client or coworker can enjoy the full gift experience. Additionally, you should always add a personal, handwritten note or card to wish them happy holidays. This is a simple gesture that makes the gift feel even more special. Corporate gifts can be difficult to find. However, as long as you follow the tips above you should have no problem finding the perfect office gifts this season. Refer back to this post when you are in the midst of holiday shopping, so that you can ensure that you are buying the perfect gift.